A decision literal expression represents decision logic which can be depicted as an expression in DMN 1.1. It consists of a literal expression and a variable. A decision literal expression is represented by a literalExpression element inside a decision XML element. The name describes the decision for which the literal expression provides the decision logic. It is set as the name attribute on the decision element. The id is the technical identifier of the decision. It is set in the id attribute on the decision element. Each decision should have an unique id when it is deployed to the Camunda BPM platform. The engine uses the id as the decision key of the deployed DecisionDefinition. The literal expression specifies how the value of the decision is generated. It is an expression which will be evaluated by the DMN engine. It can be used to do a complex calculation, to invoke a bean which provides decision logic, or to combine the output values of required decisions. The expression is set inside a text element that is a child of the literalExpression XML element. 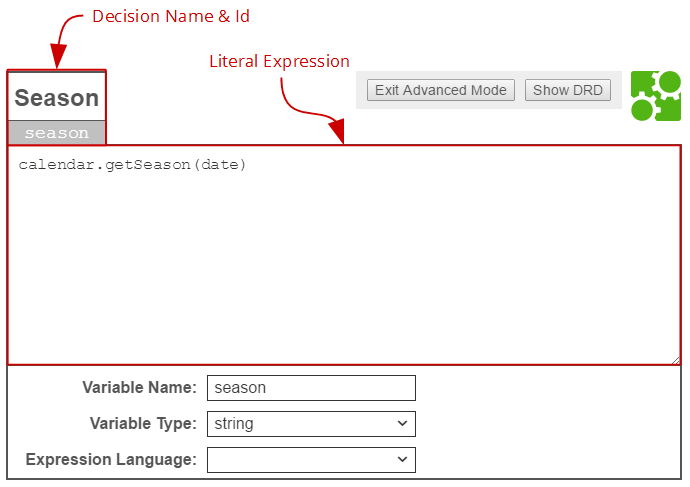 The expression language of the literal expression can be specified by the expressionLanguage attribute on the literalExpression XML element. The supported expression languages are listed in the User Guide. If no expression language is set then the global expression language is used which is set on the definitions XML element. In case no global expression language is set, the default expression language is used instead. The default expression language for literal expressions is JUEL. Please refer to the User Guide to read more about expression languages. A decision literal expression must have a variable which specifies the name and the type of the decision result. A variable is represented by a variable element inside a decision XML element. The name of the variable is used to reference the value of the literal expression in the decision result. It is specified by the name attribute on the variable XML element. The type of the decision result can be specified by the typeRef attribute on the variable XML element. After the expression is evaluated by the DMN engine it converts the result to the specified type. The supported types are listed in the User Guide. Note that the type is not required but recommended since it provides a type safety of the expression result.